Kids love learning about wildfire safety with this AMAZING activity sheet! 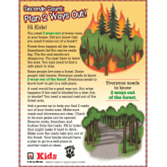 The Wildfire Plan 2 Ways Out Activity Sheet translates the lifesaving "2 ways out" fire escape message to the outdoors. New for 2017, this pad contains 100 tear-off sheets featuring a fun, wildfire maze activity. Kids love mazes, making this sheet a great conversation starter for families on planning before a wildfire event.